Build Your Own or choose from one of our Specialty Pizzas! 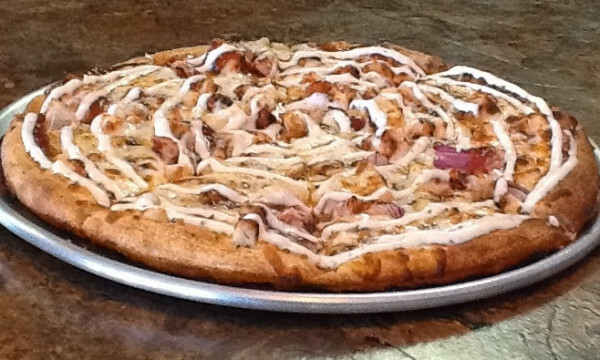 Pictured above is one of our Specialty Pizzas, the BBQ Chicken Ranch. It has garlic sauce (instead of pizza sauce), mozzarella cheese, diced chicken, BBQ sauce, red onion, and ranch on top! 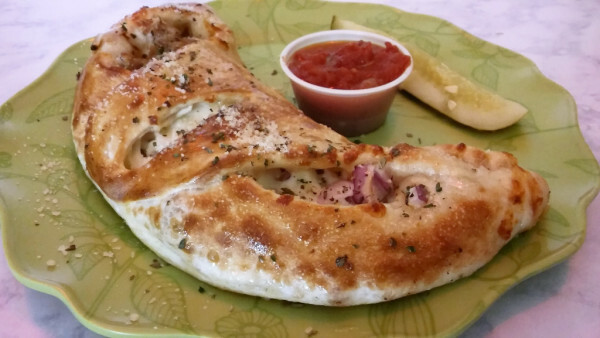 Our Calzones are made with our pizza dough, ricotta cheese, and mozzarella cheese. All calzones are served with marinara and a spicy pickle. 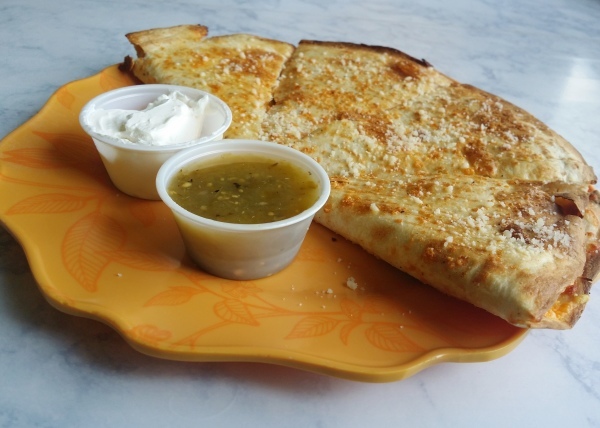 You can choose two toppings for $5.99, or choose from our Specialty Calzones. We also have a 3 topping 12" Calzone for $9.99. See our Menu for more details. Side Salads are $4.99. Our regular size Salads are $7.99. All salads come with two breadsticks and a salad dressing. Choose to Build Your Own or choose from any of our Specialty Salads. 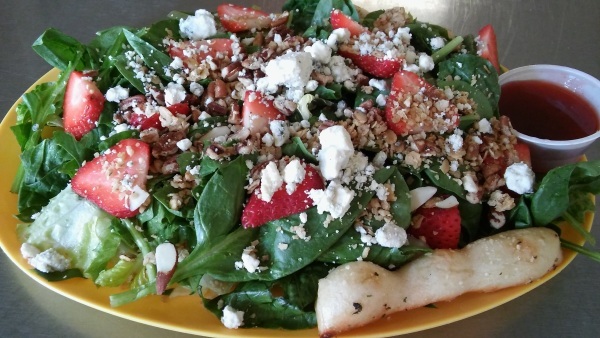 Pictured here is our Strawberry Spinach Salad that comes with lettuce, spinach, strawberries, pecans, granola, and Parmesan. Served with Raspberry Vinaigrette and two breadsticks. See our Menu for more options! Build Your Own by choosing 4 toppings and a side sauce or choose from 6 Specialty Paninis for $6.99. Pictured above is our Gonzo Chicken Panini: Diced Chicken, jalapeños, and mozzarella cheese on our flat bread; served with Southwest sauce and a spicy pickle. We have 11 Specialty Subs. Pictured above is a Honey Mustard Chicken Club Sub, Single Sub (left) and Dub Sub (right). These used to be called a Half Sub and a Whole Sub; but the Half Sub is a whole 8" Sub, the "Whole" Sub is actually 2 Subs! You can get a Single Sub for $5.99 and a Dub Sub for $9.99! 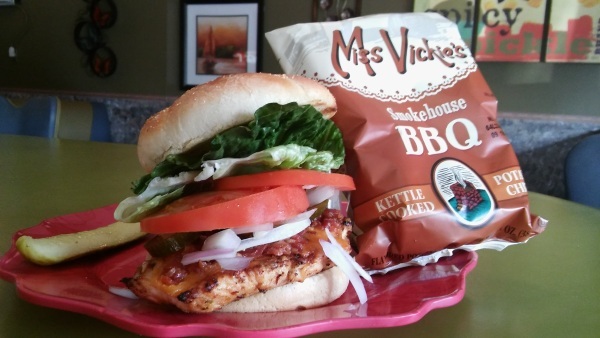 All chicken sandwiches are served on a Kaiser roll with lettuce, tomato, and onion. Also served with a bag of chips and a spicy pickle. Chicken Sandwiches are $7.99! Pictured above is our Chicken Bacon Sandwich. See our menu for more options! 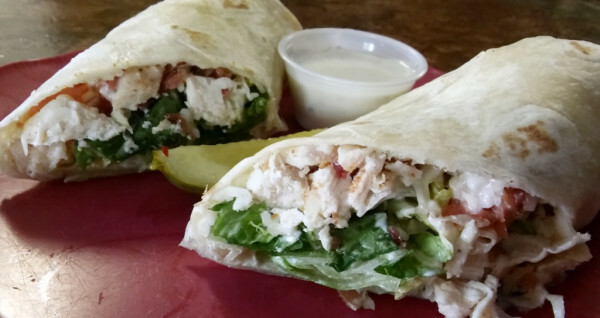 We have 17 Specialty Wraps for $6.95! Carefully selected ingredients are wrapped in a 12" flour tortilla. Pictured here is our Clubin with a Chick Wrap. It has chicken, bacon, mozzarella, ranch, lettuce, and tomato wrapped in a flour tortilla and served with a side of ranch and spicy pickle! See our menu for more options. We have Chalupas, Quesadillas, and Nachos! 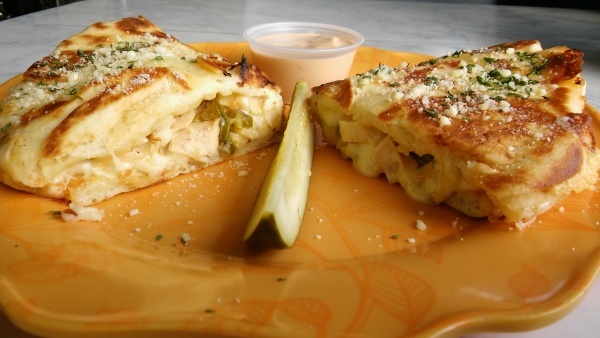 Pictured above is our Chicken Quesadilla. It is prepared with mozzarella and cheddar cheeses, diced chicken, and pico de gallo inside a toasted 12" flour tortilla. Served with sour cream, salsa verde, and a spicy pickle. We have breadsticks, cheese sticks, wings, and more! Pictured here is 12 traditional BBQ wings. 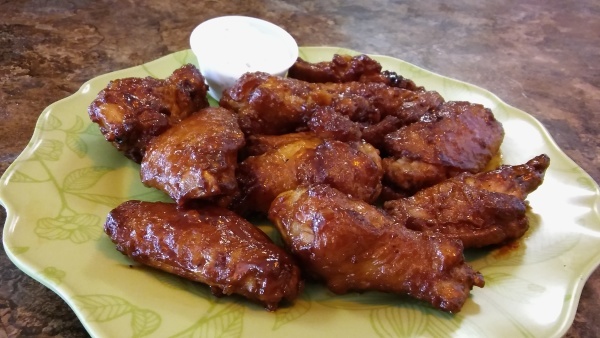 We have more than 10 flavors of traditional and boneless wings. Wings come in 6 or 12 piece orders. Wings are served with a dipping sauce and a spicy pickle! See the menu for more information and pricing. Our menu is diverse to say the least. Our food is influenced by many cultures from around the world! 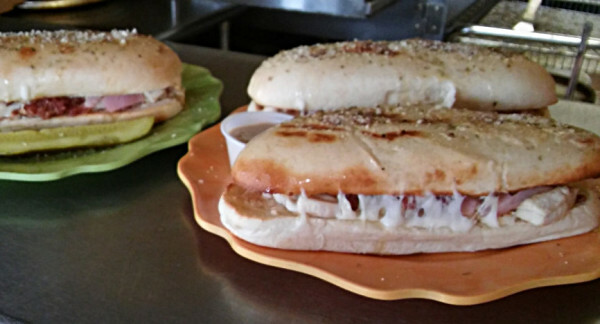 We have a wide variety of pizzas, sandwiches, salads, wraps, calzones, appetizers, and desserts. We have several "Specialty" items that have carefully selected ingredients as well as the option to "Build Your Own"! 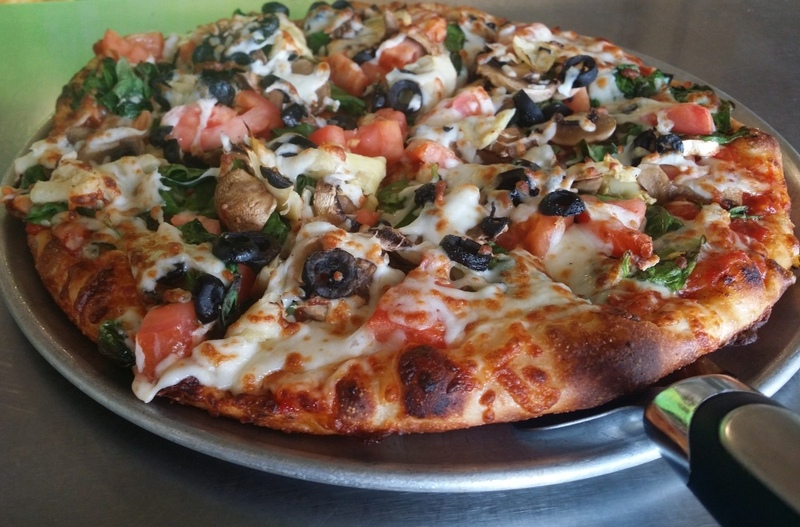 Our customers get creative with customizing their meal choices with over 50 toppings to choose from! All of our food is made to order. Our chefs are quick to put quality ingredients together for your order. We support local business by purchasing many of our ingredients locally. We are here to serve you, bottom line. Our staff offers friendly service with a smile. Excellence is the expectation of all our staff. We are focused on continuous improvement. We encourage and value honest customer feedback. Positive or negative, our customers' feedback guides our goals for excellence.